The Forget Me Not flower, by any other name would not be so sweet to gardeners, nor would the other numerous little blue forget me not flowers affectionately given the same name by their admirers. It does seem strange that through the years, both here and abroad, so many annuals and perennials have been called forget-me-nots indiscriminately. True forget-me-not flowers have been prized by gardeners for generations. Perhaps the little blue flowers of the forget-me-not are cherished because they are reminiscent of gardens of the long ago childhood gardens, or those of a beloved mother or grandmother. Forget-me-nots are water-loving plants, certainly not showy or striking; rather, their attraction is daintiness and exquisite, heavenly color. These plants can be grown as annuals or perennials but in most climates, they typically perform as biennials. Although the Forget-me-not flowers typically bloom very little during their first season of growth, they bloom profusely in their second spring. These beautiful flowers continue to bloom from early spring until the first frost and remain dormant throughout the winter. Forget me nots make great flower gifts. You can buy them from florist flower shops. Others make use of online flower services to send their regards to mothers during mother day occasion. 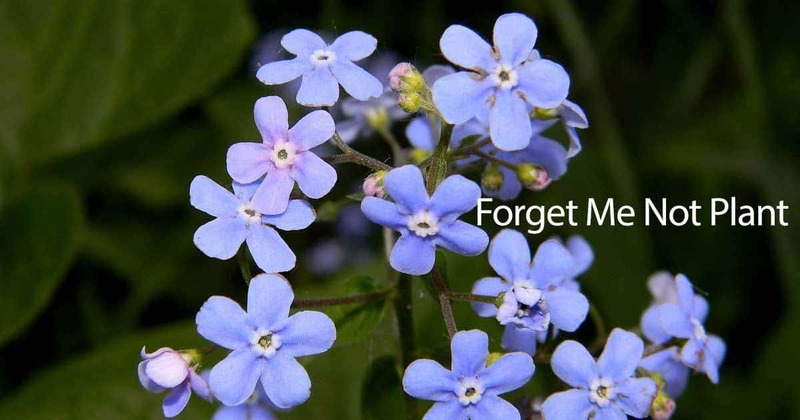 Apart from serving as a Mother’s Day flower and florist item, forget me not flowers are also used as a funeral flower. Plants usually reseed on their own if well maintained and reappear annually. What Are Forget Me Nots? Most have racemes of small, flat, bright blue flowers (some varieties of white and pink), with five petals growing thickly on their stems. Myosotis is a Greek name meaning “mouse-ear” and was given to the plant because of the shape of the small leaves. Both the annual and perennial are native to Eurasia. The biennial variety, Myosotis sylvatica (sil-vat-ik-uh) stop flowering and set seeds with the arrival of summer heat. Small seedlings appear unobtrusively in fall and bloom profusely on the following spring. The biennial variety Myosotis scorpioides (skorp-ee-oyd-eez) thrives very well in boggy locations. The perennial varieties do not put on as impressive flower show as their biennial cousins. However, they tend to flower for a longer season, usually starting from spring through summer. Myosotis alpestris is the most popular and considered by many preferable to the perennial. This annual is dwarf, growing to 9 inches, with pink, blue or white flowers. The blooms of perennial Myosotis palustris are blue with yellow, pink or white centers. This type has narrow leaves and grows somewhat taller. True forget-me-nots may be set out in spring or fall, or plants may be grown from seeds sown from early spring throughout summer. Myosotis alpestris needs a sunny, well-drained location while the perennial Myosotis palustris, frequently called the “marsh” forget-me-not, prefers moist soil and a semi-shaded location. These forget-me-nots are useful in planning a rock garden design, as a carpet around spring and summer flowering bulbs, and toward the foreground of borders. The Forget-me-nots will do exceptionally well in an area that receives filtered to moderate shade with wet gravelly soil. The natural habitat of the wild Forget me not is near stream and creek beds in several inches of water. Look for a location low and easy to keep wet. NOTE: Although you may enjoy forge me not flowers, do not forget they are freely self-seeding and spread easily. Forget-me-nots are freely self-seeding, making acquiring seed is easy. Before planting seed, incorporate organic material like compost or manure into planting beds. Sow seeds of Forget-me-not’s which take 8 to 14 days to germinate, directly into prepared flowerbeds after all danger of frost. Sow seeds indoors a few weeks before the last frost if you want plants to bloom earlier. When planting in outdoor flowerbeds, add mulch until the seeds starts to germinate. The mulch will help retain moisture and suppress weeds. Forget-me-nots can easily be propagated by separating clumps of the established plants. Keep Soil Moist – Forget-me-nots love moist soil. Never allow to dry out. Watering with a Soaker hose or drip irrigation make the watering process simple. Fertilizer Requirements – Apply slow releasing balanced all-purpose granular fertilizer at least once per season. Early spring is the ideal time. Avoid over fertilizing. Use the recommended application rate. Pruning & Shaping Forget-Me-Not Plants – Generally, these plants are ground cover plants. Pruning and shaping can be difficult. Control their growth by removing them in places where they are not supposed to extend and shape them into your desired landscape bed designs. Controlling Pest and Diseases – overall diseases and insects are not too common. In some cases, aphids tend to affect new foliage growth. Control aphids with applications of insecticidal soap sprays. Keep an eye out for Flea beetles which often infest Forget me nots and puncture the leaves. Learn more in our article: How To Control Flea Beetles. Forget-me-nots create offer a soft beauty to gardens. They are easy to maintain and do well when planted them in rich soil and kept well watered. These tiny blue flowers have been cherished and remembered for generations. This can be attested to by the numerous legends regarding their origin. These “legends” have persisted and been handed down in many different lands. One of the earliest and most delightful of these legends comes from Wales, an unusual source for such tales. In that country in the mountains of Glamorgan, fairy gold was hidden so goes the story. On the mountainside nearby grew a carpet of bluest forget-me-nots, dainty and ethereal. Evil men heard rumors of the elfin gold and decided to steal it. They took no notice of the heavenly blue of the flowers close by. The men paid no attention and were about to disappear with the loot, regardless. This angered the mountains and they shook their sides, swallowing up both men and gold. The forget-me-nots, too, were covered for a time but soon thrust their way up and up to deck the mountain slopes once again covered them with blue. There they continue to grow and bloom. NextSub Irrigation Planters: Is A SIP Right For You and Your Plants?